A pioneering public organisation is taking a stand against the growing problem of homelessness on the West Coast. In so doing, it is re-defining the very idea of a library. Every weekday morning at ten, there is a scrum to enter Seattle’s Central Library. As soon as the security team open the double doors, patrons, many of whom wear two coats even in the height of summer’s heatwave and carry enormous holdalls on their backs like tortoises, stream into the building. Some head straight to the bathrooms, others get their laptops out or pick up the morning’s edition of USA Today or the Seattle Times. 130 people are ahead of me in the queue for one of 33 copies of Olga Tokarczuk’s Flights. As I place my reservation from an expansive floor of Seattle’s magnificent, ten-story public library, it’s clear the city has a great book culture. But, like many places in the US, the city also has a great homelessness problem. Andrew Constantino, 43, pictured below, is a homeless man who lives at Georgetown encampment in south Seattle. Andrew has been homeless for six years and uses his experience to consult on homelessness for non-profit groups in Colorado and Idaho. He says homeless people in Seattle have more trust in the public library than they do for other providers of support such as shelters or charities. According to Andrew, homeless people value the library’s non-judgemental environment and its specialist support. Sustained by philanthropy and public funds, the Seattle Public Library has units devoted to mental health counselling, job training, legal assistance, domestic violence support, medical help, food aid and securing housing. Andrew spent a year living in shelters where, despite the prevalence of mental health and drug crises, the importance of filling beds to meet targets overrode safety precautions such as weapon searching. He has found that projects and services run by charities in conjunction with the public sector tend to be too top-down and bureaucratic. Monique le Conge Ziesenhenne, president of the Public Library Association, says that when it comes to administering services to the most vulnerable, the libraries have a key advantage over other state organisations. Home to Starbucks, Boeing, Microsoft and Amazon, Seattle is booming. Yet the liberal West Coast city also has the third-largest homeless population in the country. Here, approximately 12,500 people live on the streets. That’s one in 175 residents of King County, the greater Seattle area. 200 homeless people die on its streets every year. The causes are many – austerity, the opioid crisis and homeless migration – but the overriding factor is the wave of gentrification. Fuelled by the technology industry, Seattle has changed enormously in a generation. Much of the city is barely recognisable. Belltown, once the heart of grunge music, where an artist could get a studio for $100 a month, is now dominated by luxury flats. Today, the average rent in the neighbourhood is $2,050. Seeking to reduce their own homelessness problems, many US cities give people living on the streets a one-way ticket West. But in Seattle, homeless migrants from outside Washington State make up just five percent of those without housing. Attesting to the effects of spiralling rents on homelessness, four-fifths of those living on Seattle’s streets used to have housing in King County. Seattle’s homelessness crisis was declared a state of emergency in 2015. 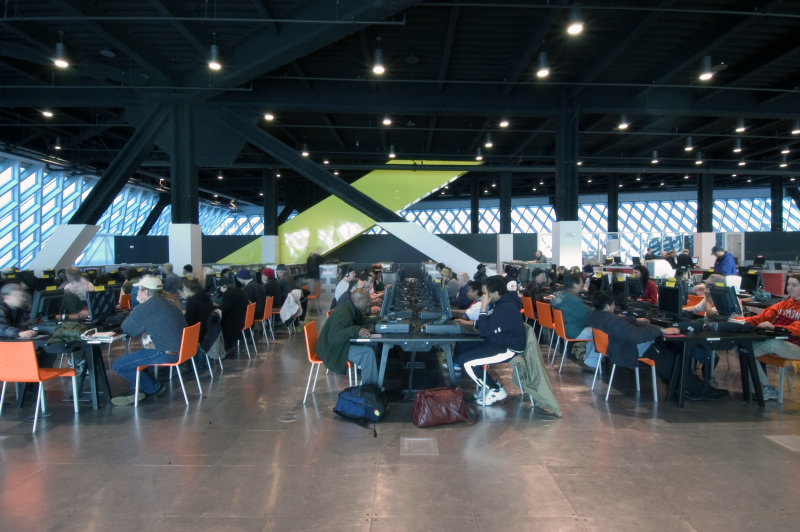 Working with homeless patrons is a core part of Seattle Public Library’s mission: to deliver universal access to information and provide opportunities to improve the lives of people in the community. Michelle Jaquish, a social worker based at the library, says her clients defy the stereotypes. The layout of the Central Library, an award-winning glass building that opened in 2004, was designed to be as homeless-friendly as possible. Its architects created plenty of open spaces, clear lines of sight, and ventilation to combat the effect of humidity, musty books and body odour. The bathrooms, with low cubicle doors for ease of access in an emergency, are regularly used by patrons to clean their teeth or freshen up. Although a sign on the wall prohibits using the sinks to wash in, I have often seen people cleanse their hair with soap from the dispenser. Chris Hogan, the Safety and Security Supervisor, has four or five officers on duty at any given time. He sees his role as resolving any difficulties between patrons and instilling a welcoming culture that accommodates all users. When someone breaks a library rule, he and his team notify the person gently. “Every contact we make with someone begins by saying ‘you may not be aware, but…’,” he tells me. A crucial part of the library’s appeal to the homeless is its computers. In today’s technocentric world, a digital divide has formed between those with and those without an internet connection. And beyond its 27 branches, one of the library’s key programs sets aside 50 mobile Wi-Fi hotspots for homeless encampments and tent cities across Seattle. Funded by the city and a grant from Google, the hotspots reduce the effects of the digital divide and boost social inclusion for homeless people in encampments such as Georgetown. Georgetown is a city-permitted tiny-house village for fifty homeless people set in what was a derelict spot in an industrial area of Seattle. On one side is a fire station, and on the other, aircraft take off from the Boeing Flight and Test Operations runway. Also in earshot are freight wagons, chugging along the nearby railway line. But as you walk through Georgetown’s metal fencing and closed double gate, the feel is much more homely. Beyond an open space with a table and an array of miscellaneous chairs are one-room wooden cabins the size of beach huts, painted in pastel blues, yellows and oranges. There are bicycles leaning against the houses and neat troughs for growing vegetables. The encampment received a permanent router from the library in August, and wifi provision is making a tangible benefit for residents such as James Walker, a man in his late fifties, who works in internet sales. He is trying to get his life back on track after addiction and eviction. An avid reader, the Seattle Public Library forms a basis for his cultural life. “I like new thought, music and Christian mysticism. I’m a huge William James fan,” he says, referring to the fin-de-siècle philosopher and psychologist. Andrew Constantino, the homeless man whose advice is sought in Colorado and Idaho, was part of the city’s planning process for the development of Georgetown. He lives on the site and has the volunteer position of deputy head of security. He says the community values the simple benefits of the hotspot, such as video-calling loved ones. Andrew has been sober for ten years and came to Seattle from Baltimore when he was in his early twenties. Public libraries across the US are a haven for the homeless during the daytime, when those staying in shelters might be asked to leave at 6am. Libraries provide homeless people with respite from bitter winters and oppressive summers. In August, smoke from Canadian wildfires deposited a sheet of smog-like pollution over Seattle for two weeks. Air quality in the city was worse than in Beijing. With official health recommendations to stay inside as much as possible, the library was once again a crucial sanctuary for those living on Seattle’s streets. Homeless people are especially vulnerable to extreme weather and Andrew is emphatic about the value of the library as a daytime refuge. “The library literally saves people’s lives,” he says. But, as Andrew adds, using the library is about much more than just accessing a safe space to spend the day. Despite all this, a Forbes article published in the summer (and since taken down) advocated closing public libraries in the US, arguing that two Seattle-based companies, Amazon and Starbucks, have made them obsolete. Instead, public libraries should be given more financial support. Public libraries such as Seattle’s are highly effective organisations that connect hard-to-reach parts of society with public services. In Seattle’s case, the trust the library has carefully established with the homeless population and other at-risk groups over many years puts it in the best position of any organisation to administer social services to the most vulnerable. Policy-makers on a local and a national level should direct resources to libraries, so they can launch or expand their social services. Libraries should also be proactive and bolster this funding by partnering with the private sector, as Seattle Public Library has done with Google. Indeed, there is an opportunity to capitalise on many businesses’ stated concern for corporate social responsibility. Accountancy firms could provide tax advice, law firms could offer legal aid, and technology companies could donate the libraries’ hardware and software. This multi-faceted approach would make the best use of an important social institution. In so doing, it would reshape the very idea of a library. Daniel Rey is a writer based in Northern California.​ Images courtesy of Daniel Rey and the Seattle Public Library.